At our most recent coaches meeting we decided that we wanted to honor 2 members per month, one from the High Intensity Cross Training classes and one from the Strength Training classes, for exemplary effort, dedication and performance. Though being named member of the month won’t earn you any material gifts it does earn you a certain amount of badassness and that, as we know, is even better. For January the coaches met and voted to name Courtney Bodendorf and Wendy Bauer as our members of the month. Courtney joined RAW less than a year ago and in that time we have been incredibly impressed with her effort and dedication. Most recently she conquered a personal chin up goal as well as PR’ing her time on “Annie.” During the 630am class, members and coaches alike can look to Courtney for inspiration and dedication to the day’s workout. It isn’t always easy for her but she never gives up. She challenges her strength and speed on every workout, maintaining form on each exercise. We are so proud of how far you have come Courtney and thankful for the example you set for our members! Keep striving, keep improving and never give up on yourself, your dedication will help you achieve all of your goals! 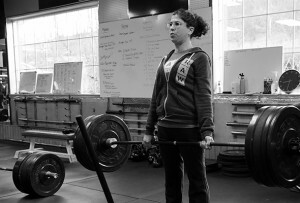 Wendy joined RAW last March but more recently began concentrating on the lifting program. In the time since she began consistently attending the Strength classes, Wendy has shown improved focus, enhanced dedication and increased strength. Though she would love for you to think she is less of a beast than she is, the strength coaches agree that the classes would not be the same without her. Her form, commitment and dedication to the program have lead to significant increases in her personal strength development. Though we once had to encourage Wendy to try going heavier, she now asks if she can each time. We are so impressed by your focus and commitment to lifting Wendy! Keep that determination going and we are sure you will hit your goals in no time!